The past 7-10 days have just been hell! The boss resigned, my work life is on end and so damn stressful that I amazed I have not quit and gone home several days, and that my hair is all still in my head. I apologize to my readers for the change in the look of my blog, I am bouncing between 2 different themes/backgrounds/layouts trying to decide which one I like best. Hang with me I will figure it out. 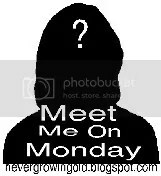 “Its a great way to to meet new friends and for others to get to know me better….one Monday at a time!! !”….as quoted by the Chacogirl!! I will make this SIMPLE and FUN!!! We have 5 TVs in the Princess Palace. On large screen in the family room, then 4 of the Divas also have a TV in their room. I currently do not but keep hoping to finally afford a small flat screen for my room, it just is not a big priority at the moment. My nightstand is across the room, holds a lamp and a decorative box on the top of it. Next to the bed is my vanity which has my glasses, watch, some lotion and a lamp as well. My kitten enjoys getting up there at night when I am asleep and knocking the lotion and eye cream off on to the floor..and my watch, and my glasses.. Roughly off the top of my head 15 pair? Not all that into shoes, for certain no more than 20. That said, some are summer/warm weather ones, some are colder weather, and a pair of riding boots for those opportunities to be fender fluff on someone’s bike. That would be a big NO. I know it is something I SHOULD know how to do, and probably should be something I learn, but it is not currently in my DIM (Do It Myself) manual. Both, depending on my current mood and if I am suffering from PMS. My favorite way to get them both is to mix Brach’s Candy Corn and dry roasted peanuts together. 1. We have three TV’s…one 56″ in the Family Room, a 42″ flatscreen in the Bar for watching the dreaded Bengals, Reds, the World Cup and various other sports! and a small flatscreen in the Kitchen for my own personal enjoyment (when the damned sports aren’t on). 2. I do not have a bedside table. 3. Shoes? OMG to many to count. I am a self confessed shoe-holic. I still have (and wear) many from junior high! 4. Of course I can change a tire. Can actually switch out an engine too….but I don’t HAVE to anymore so those skills are rusty.